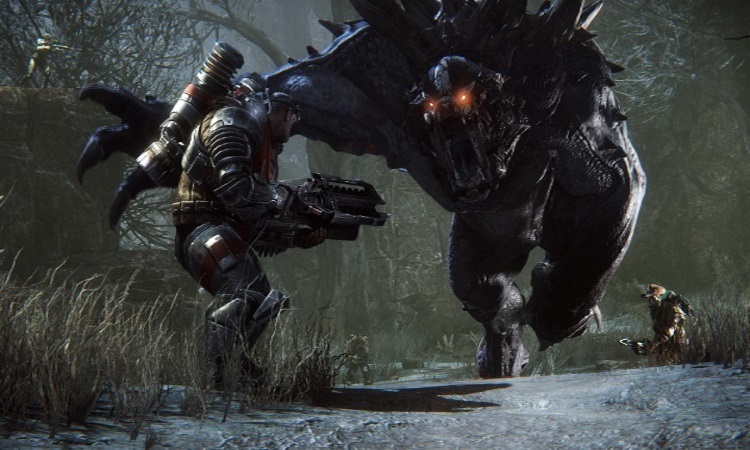 Evolve is a tempting, tempting prospect. Call me cynical, but the concept itself sounds like something that can’t possibly be as awesome as it sounds. The fact remains, though: it sounds very awesome indeed. Essentially, it’s made its way to the lofty heights of one of my GameZ of 2015 for one reason. It’s a Monster Hunter dream come true. For the uninitiated, Monster Hunter is a co-operative action RPG experience that sends you on a series of missions. Your objective in all of them is generally to bash huge dragon-things in the face until they keel over. You then harvest their bodies for parts, use said parts to upgrade your gear, and use that to bash even huger huge dragon-things. When the hugest of the huge dragon-things is toast, the credits roll. For the most part, this can all be done in singleplayer (with or without a scrawny little AI ally by your side). But for me, online co-op play has always been the heart of the series. I’m a support player by nature; paralysing a monster with status arrows for your teammates to whail on and celebrating the victory with them is a special thing. Your online hub is even a tavern, enhancing that spirit of let’s-get-drunk-together comradeship. With all of this said, there’s one thing that many a Monster Hunter player would like to see. It’d stick out like a sore thumb and be completely ridiculous, but it would be a sight to behold: giving one player control of the monster and letting them loose in an attempt to destroy the rest. Which is where Evolve comes in. It’s a completely unrelated game, of course, and plays in first-person. Nevertheless, it casts four players as the hunting party and a fifth as the monster, which is really all I needed to know. 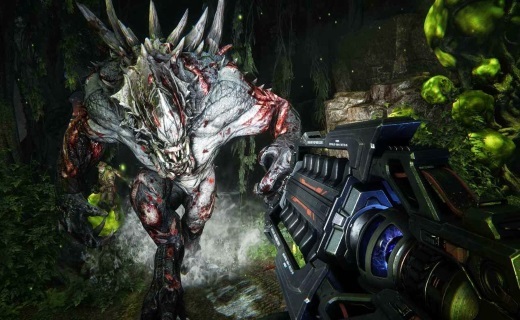 Evolve is set in the far reaches of space, where human colonies on the planet Shear are under attack by furious slavering aliens. Mounting the counterattack is one William Cabot, retired space marine sort charged with evacuating the surviving colonists. To do this, he assembles a battle hardened team. From mercenary soldiers to dangerous psychopaths, anybody who can take these things out joins the fight. Four game modes have been shown thus far: Hunt, Defend, Rescue and Nest. They’re all variations on the beast vs human team concept, but play out rather differently. There is generally a tactical element beyond ‘straight up shoot-tastic shooting and/or clawing’ involved too. With Nest, for instance, the alien player must defend six eggs located about the map, while the humans have ten minutes to destroy them. Meanwhile, Rescue turns the tables, tasking the humans with protecting and evacuating injured colonists before the creature kills them. The first-person format brings another interesting twist to the game, in the form of FPS style classes. The hunters choose from four job roles: Assault, Support, Medic and Trapper. They’re all fairly self-explanatory, boasting their own little tricks like the Trapper’s forcefield to keep the quarry in place. Evolve is released on February 10. It’s foremost on my radar for its Monster Hunter-ish tendencies and its unusual asymmetrical gameplay.